The prophet Ezekiel reported the following incident in the land of the Chaldeans by the river Chebar : ... And I looked and behold a whirlwind came out of the north, a great cloud and fire unfolding itself, and a brightness were about it, and out of the mist thereof as the colour af amber, out of the midst of the fire. Also out of the midst thereof came the likeness of four living creatures. And this was their appearance : they had the likeness of a man. And everyone had four faces, and everyone had four wings. And their feet were straight feet; and the sole of their feet was like the sole of a calf's foot; and they sparkled like the colour of burnished brass.... When they went they went upon their four sides; and they turned not as they went. As for their wings, they were so high that they were dreadful; and their wings were full of eyes round about them four. And when the living creatures went, the wheels went by them; and when the living creatures were lifted up from the earth the wheels were lifted up. 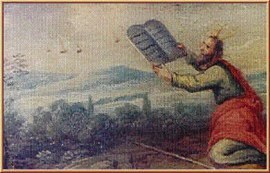 Old Testament Prophet Ezekial watched a "wheel" descend from the sky. The craft landed on the banks of the Chebar River where Ezekial was taken aboard and flown to the Tel Aviv Mountains. The full description of the object is found in Ezekial Chapter 1. Egyptians during the reign of Thutmose III were witness to the landing of a "circle of fire." The craft was "one rod long and one rod wide." After a time, the ship shot back up into the sky. Over 100 witnesses. This may have been 1500BC? Scotland's King Domnall Mac Murchada witnessed a luminous, flying object while attending a fair in Teltown, Meath County. The object was often seen moving over Scotland in the night sky. 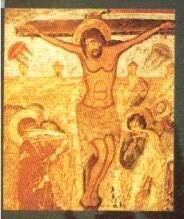 The Archbishop of Lyons, Agobard, wrote, in his "De Grandine et Tonitrua," that he had stumbled upon an angry mob lynching three men and a woman. When asked why these people were to be hanged, the mob responded that they were people who landed from a "cloud ship" in Magonia. The Archbishop promptly freed the men and the woman who the mob thought were going to use magic to spoil the year's harvests. Over 1800 witnesses. Peasants and aristocrats alike were dazzled every night for many weeks by multiple luminous objects that danced across the sky. On a clear Sunday morning the town of Reims, as well as the whole of eastern France including Verdun, watched the skies, fearful that the mass of objects that appeared overhead were signs of the Apocalypse. Sailors on a merchant expedition were startled from their sleep by a huge, cylinder-shaped craft. The object remained visible to the crew for many minutes before disappearing into the distance. People on the streets of Tokyo watched as two luminous object hovered in the night sky. Minutes later, several smaller, white objects disengaged from the two larger craft. All of the objects circled over Tokyo for about an hour before vanishing. Merchant scribes along the Nile wrote in their logs that many saw large, noisy craft hovering above the bustling Cairo streets. Over 10 witnesses. Farmers, planting seedlings in their rice patties, watched as a saucer shaped craft wavered in the sky. It descended rapidly, almost crashing into the ground. As quickly as it had appeared, the craft regained stability and climbed out of sight. As recorded by Matthew of Paris, St. Alban's Abbey was over flown by a large, luminous object described as a ship. An ancient manuscript found in Byland Abbey and belonging to the ancestors of Henry, the Abbott, reads, "There was a great portent outside. A large round silver thing like a disc flew slowly over them and excited the greatest terror." People, partaking in the feast commemorating the Saints of Simon and Jude, rushed out into the night to witness this mysterious phenomenon. Monks at Byland Abbey observed a slow saucer shaped object fly over their compound in the night sky. "A fiery thing like an iron rod of good length and as large as one half of the moon was seen in the sky for a little less than a quarter of an hour," wrote Jacques Duclerc in his "Memoirs of a Freeman of Arras." 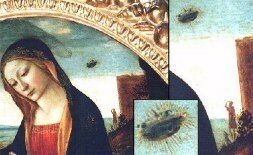 Indeed, many others witnessed this saucer-shaped object. Enormous spheres reportedly flew across the sky performing chase maneuvers. One globe would fly to the opposite horizon while the other would pause then follow. While observing solar phenomena, two separate astronomical observatories reported seeing a large shape move across the surface of the sun. However, according to paths of the planets that the astronomers plotted, the shape could not have been Mercury or Venus. An anonymous Swiss astronomer observed the flight of a large spindle shaped craft resplendent with a glowing outer ring. As well, a fellow astronomer in the nearby town of Sole observed the craft. "Northeast of the Terrace, in clear sky and warm weather, I saw appear suddenly an oblong cloud nearly parallel to the horizon. Below the cloud was seen a luminous body, brightly lit up and almost stationary... This strange ball at first appeared bluish and faint, but its light increased, and it soon began to move. At first, it ascended above the horizon, obliquely toward the east. Then it changed its direction and moved parallel to the horizon. It vanished in the southeast. I saw it for half a minute, and the light it gave out was prodigious. It lit up every object on the face of the country. It changed shape to oblong, acquired a tail, and seemed to split up into two bodies of small size. About two minutes later came a rumble like an explosion," wrote Tiberius Cavallo, Fellow of the Royal Society, in his memoirs. Three people witnessed approximately fifteen ships in the air. These craft were close enough for the witnesses to see "sides and ports." A brightly lit object, described by several witnesses as an airship, flew over Baton Rouge. UK, London, Hatton Garden, 08/10/1809, "I saw many meteors moving around the edge of a black cloud from which lightning flashed. They were like dazzling specks of light, dancing and traipsing through' the clouds. One increased size till it became of the brilliancy and magnitude of Venus, on a clear evening. But I could see no body in the light. It moved with great rapidity, and coasted the edge of the cloud. Then it became stationary, dimmed its splendor, and vanished. I saw these strange lights for minutes, not seconds. For at least an hour, these lights, so strange, and in innumerable points, played in and out of this black cloud. No lightning came from the clouds where these lights were playing," wrote Astronomer John Staveley in the "Journal of Natural History and Philosophy and Chemistry." USA, Massachusetts, Amherst, 08/13/1819, 20:30, Professor of chemistry Rufus Graves watched a luminous object fall into the yard of his neighbor Erastus Dewey. They examined the saucer-shaped object and withdrew a pulpy substance with a nauseating smell. After a few days, the substance evaporated leaving only a slight residue. USA, New York, Manchester, ??/? ?/1820, Mormon spiritual leader Joseph Smith said that an airship, flying over Manchester, had landed near him. Smith met with several occupants of the airship. France, Ebrun, 09/07/1820,"Numerous observers have seen, during an eclipse of the moon, strange objects moving in straight lines. They were equally spaced and remained in line when they made turns. Their movements showed a military precision," M. Francois Arago wrote in the "Annales de chimie et de physique." France, Saarbucken, ??/? ?/1826, A gray torpedo shaped craft was observed as it fell to the Earth at enormous speeds. No explosions were heard nor wreckage found. Sighted throughout Ohio, a hook shaped flying object is observed hovering intermittently over various cities in the state. People watch the flight of a rotating, donut shaped UFO. The craft hovers over the city for a time before moving off to the south towards the sea. Shaped like a torpedo, a large UFO surprises the normally cavalier citizens of France by moving across the entire country. Several members of a dinner party observed a luminous object about 300 yards in length hovering above the skyline. It was described as very beautiful with the color of a red-hot stove. A large, cigar shaped object overflies the south of England, and is observed by the farming communities located there. Captain Banner and his crew of the Lady of the Lake, on a merchant voyage, found themselves being shadowed by a strange, metallic flying disc. The aft portion of the craft was semi-luminous with a long tail extending from the center of the craft. Flying into heavy winds, the ship ascended out of sight after half an hour. Hovering over Marseilles for close to nine minutes, an incredibly large saucer moved to the north then to the east criss-crossing the skies over the city. Observers kept the craft in view until a little after 11:00pm whereupon the object vanished. At the Meudon Observatory, an astronomer watched many luminous objects careen through the night sky. One floated to the Earth and landed "like a disc falling through water." A huge, trumpet shaped UFO, 400ft in length, hovered over the Mexican metropolis of Oaxaca for almost six minutes. People stared up at the object fearing it was an omen of doom. An unknown observer wrote, "fiery spheres, extremely luminous, came out of a cloud of a peculiar shape and went slowly toward the north for one hour." It seems many brightly lit shapes emerged from a cloud shaped like a cigar. Formations of UFOs were observed flying over the Welsh coast for as much as a week. Eight craft would appear and fly in a triangle configuration almost as if on a reconnaissance mission. After a hard working day Texas pioneer John Martin peered up into the sky to check the time by the sun. Instead, his eye caught sight of a disc-shaped object flying over the Texas plains. He described the craft as a "saucer," and found that it moved "at a wonderful speed." MV Vultur's crew were startled by two extremely bright "wheels" of light that alternately hovered and swooped low above the surface of the sea. After their pattern reached a climax, the craft both disappeared. The busy people of Marseilles stopped working for a moment to watch many formations of disc-shaped objects cross overhead in the sky. Astronomer Jose Bonilla, at Zacatecas Observatory, photographed formations of 15 to 20 disc-shaped objects crossing the face of the sun. "On November 1, at 9:30pm, there was seen, west of Adrianople, an elongated object giving off a strong luminosity. It seemed to float in the air and its apparent disc was four or five times larger than the full moon. It traveled slowly and cast light on the whole camp behind the station with a brightness about 10 times greater than a large electric bulb. In the morning of November 2, at dawn, a very luminous flame, first bluish, then greenish, and moving at a height of five to six meters, made a series of turns around the ferryboat pier at Scutari. Its blinding luminosity lighted the street and flooded the inside of the houses with light. The meteor was visible for one minute and a half and finally fell into the sea. No noise was heard when the immersion took place," M. Mavrogordato wrote in "L'Astronomie." A ship crossing the Atlantic, en route to America, was overflown by a luminous sphere that emerged from the ocean. It flew against the prevailing wind alongside the ship, but, as suddenly as it had appeared, it ascended into the night sky. According to the memoirs of the Minor Brothers, several lines of bright spheres were observed flying through the night sky. Students at a men's college watched as a metallic disc rose above the trees lining the campus. After a few seconds of stable hovering, the disc shot off at incredible speed towards the east. Country folk in the green hills of England found themselves transfixed by a luminous, star-like object that rose over a forest and moved off to the east at high speed.